Chicharrón is crispy, fried pork rind made throughout Latin America. It has a fairly neutral taste, and can be somewhat chewy. It can be used as an ingredient in stuffings (such as those for Pupusas), in stews and soups. 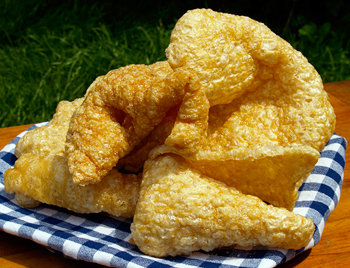 Chicharrón can also be made and sold as a street-food snack. When sold like this, it will be a large piece, perhaps about 10 inches (25 cm) square, drizzled perhaps with hot sauce and lime juice. In Mexico, the Chicharróns are deep-fried at two different temperatures to get them to puff. Serve with dips and sauces; pretty dull on their own.